Seniors on the Move - "Historic Period Dinner"
Weds, Nov 6th 5:00 p.m. - 8:00 p.m. Historic Period Dinner programs are so much more than a meal. You'll be transported back in time to experience an intimate dinner gathered around the wood stove and learn about life in the past from your cook and dinner hosts. There will be two dinners served, one in the 1900 Farmhouse and the other in the 1875 Tangen House. If you dine in the 1875 home, you will stroll along a lamp-lit boardwalk up to the house and sip spiced punch next to the parlor while a host shares stories of Victorian life. 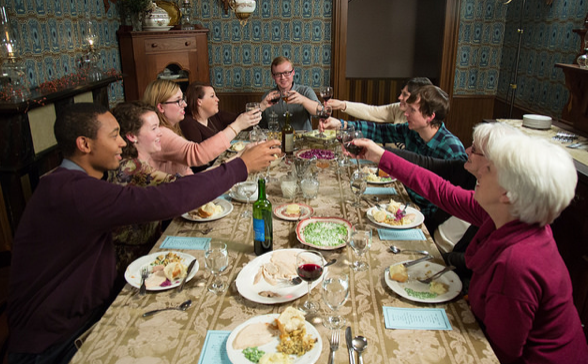 You'll savor a multiple course meal in the refined dining room as historical interpreters serve dinner family style. After dinner, gather with fellow guests for lighthearted parlor games, such as a Victorian guessing game or "Hunt the Thimble." If you dine in the 1900 farmhouse, a horse-drawn wagon carries you to the home, where the smell of freshly baked rolls and hot cider welcomes you. Enjoy a hearty home-cooked meal by the warmth of the stove served family style by historical interpreters. Make room for dessert with a lantern-lit trip outside to the historic barn, built in 1889 or stay inside and read the 1895 Montgomery Ward catalog and play a game of checkers. After dessert, bundle up for the wagon ride back to your car. 5:00 p.m. Meet at the Living History Farms, 11121 Hickman Rd, Urbandale. Specific details on parking and group distribution will be provided closer to the event date. 8:00 p.m. Estimated Arrival back to your cars.